A Neutron stars should exhibit both superfluidity and superconductivity, according to two independent groups of scientists. 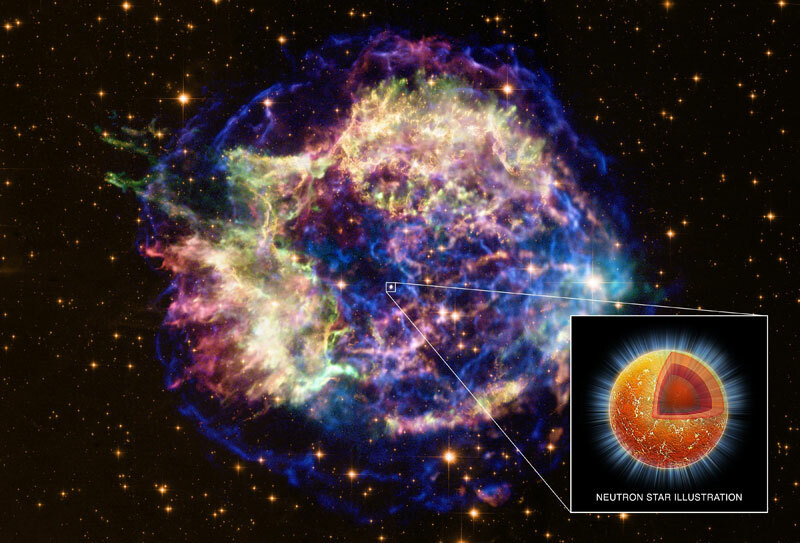 The researchers studied the neutron star in the supernova remnant known as Cassiopeia A, and found that its core should exist in a superfluid state at up to around a billion degrees kelvin, in contrast to the near absolute-zero temperatures required for superfluidity on Earth. Neutron stars are extremely dense objects that form when massive stars run out of nuclear fuel and collapse in on themselves. The enormous pressure within the star forces almost all of the protons and electrons together to form neutrons. Astrophysicists would like to know more about the properties of this ultra-dense matter, and one way to do this is to study exactly how neutron stars cool. The object at the heart of Cassiopeia A, which is about 11,000 light-years away, is ideally suited to such an exercise because, unusually, it has both a well established age – about 330 years – and a well known surface temperature – around 2 million kelvin. Last year, Craig Heinke of the University of Alberta in Canada and Wynn Ho of the University of Southampton in the UK analysed 10 years’ worth of X-ray data from NASA’s Chandra satellite and found that the Cassiopeia A neutron star’s surface temperature has dropped more quickly than expected – by about 4% between 2000 and 2009. In the current work, groups led by Dany Page of the National Autonomous University in Mexico and Peter Shternin of the Ioffe Institute in St Petersburg, Russia, say that this rapid cooling can be partly explained by invoking the zero-viscosity state of matter known as superfluidity. They argue that when the temperature of a neutron star falls below a certain critical value it becomes energetically favourable for neutrons inside the star to form Cooper pairs – the basic unit of the superfluid state – and that the energy released as a result could be easily removed from the star in the form of neutrinos. But the two groups have found that this mechanism cannot account for all of the cooling, and they independently conclude that superconductivity must also play a role. They say that shortly after the creation of the neutron star, protons would combine to form Cooper pairs, so creating a superconducting state by virtue of their charge. Bound up in this way, the protons would not be able to take part in various neutrino-emitting reactions that occur in non-superfluid matter, reducing cooling early on in the life of the star and leading to a sharper drop in temperature later on. However, there are alternatives to the superfluid/superconductor hypothesis, such as the idea that the rapid cooling was simply the natural consequence of the temporary heating created by an asteroid impact. Excluding this and other ideas will require further data from Chandra – with a subsequent rise in temperature suggesting that the star could in fact be experiencing asteroid impacts, while a continuation of the cooling would support the theory of the Page and Shternin groups. If this new model is correct then, as Wynn Ho, who is also a member of Shternin’s group, points out, neutron stars would probably contain the hottest superfluids and superconductors in the universe. Indeed, Shternin’s team has calculated that the Cassiopeia A neutron star should exhibit superfluidity when its temperature drops below about 800 million kelvin and that proton superconductivity could take place at up to 2–3 billion kelvin. Page and colleagues, meanwhile, calculate the superfluid transition temperature to be around 500 million kelvin. These figures are in stark contrast to the 130 kelvin that is the highest temperature at which any material on Earth has been found to superconduct. But Ho cautions that we can’t draw any practical tips from neutron stars, pointing out that the huge densities of these objects mean that particles are extremely closely packed and so act via the strong nuclear force, whereas on Earth superfluidity and superconductivity are mediated by the fundamentally different, and much weaker, electromagnetic force. This entry was posted in Nature and tagged Cosmology, Neutron Star, Physics, Universe. Bookmark the permalink.